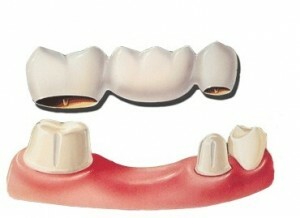 When we talk about tooth bridges we are talking about replacing missing teeth. 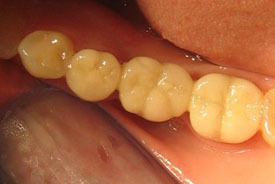 Typically a gap of one or more teeth, where we crown the teeth on either side of the gap and connect them with lab fabricated teeth. The alternative is usually a partial denture. 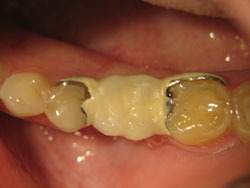 The main difference between the two is that the tooth bridge is a single solid piece that is permanently cemented into the mouth (the partial needs to be removed and cared for). Call us at our Lemont dental office and we will discuss with you your options. Our belief in bridgework is the simple conviction that the quality of life is improved. This may sound lofty, but there are very real, very significant benefits. 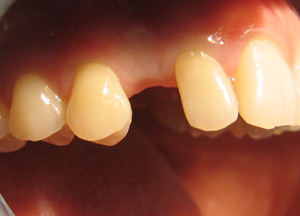 Appearance is a motivator for some patients, especially when front teeth are missing. We believe a bridge can contribute to higher self-esteem and refined speech. Your tongue moves more naturally as you speak–without whistling or lisping. 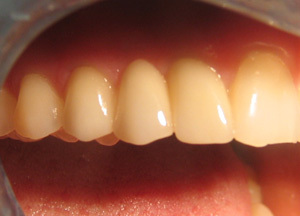 “Occlusal stability” refers to a strong, functional bite–a fine-tuned machine, if you will. 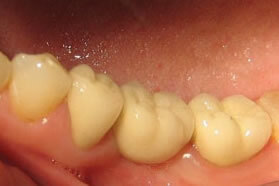 Missing teeth, however, contribute to an erratic bite, which in turn will wear healthy teeth down to “balance” a bad bite. Comfortable eating is at issue, surely something basic to our lives. A finely made bridge can recover both lost form and function. Without it, even a single missing tooth undermines your health and vigor over time.